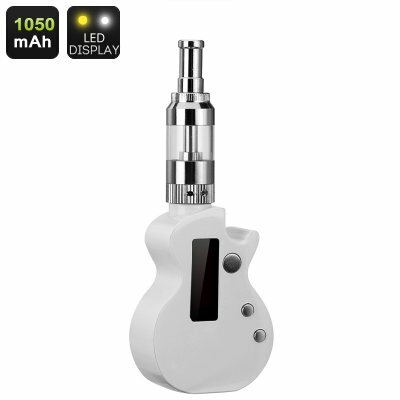 Successfully Added Guitar-Shaped Electronic Cigarette - 10Watt, LED Display, 1050mAh Battery, Temperature Control, 1.0-2.0 ohm Resistance (White) to your Shopping Cart. For all the vaping loving guitar players out there we now have this beautiful E-Cigarette that has been shaped like a guitar. Perfect as a gift, this guitar-shaped e-cig is guaranteed to put a smile on the face of any artistic person out there who’s in love with music. Despite its shape, this vaper is extremely compact and portable – making it easy to slip in your pocket and carry along wherever you go. Whether you like to grab the attention and steal the show during an upcoming music festival, or simply like to enjoy a relaxing vape in the comfort if your friends – this beautiful E-cigarette can be perfectly used at any occasion. Featuring a sophisticated LED display that has been intergraded within its guitar design, this vaper keeps you constantly updated about the current status of your e-cig. Not only does it display your current battery level – ensuring that you’ll never again run out of juice unexpectedly, it also shows you the mod’s currently used Wattage and a whole lot more. With all this data easily available you can be assured that you’ll always use the right settings to take the absolute most out of your upcoming vaping sessions. With a resistance up to 2-ohms, this artistic little vaper mod can handle plenty of Wattage. Enjoy great flavors and produce exceptionally large vapor clouds that are sure to impress all people standing by – with this little e-cig you’re guaranteed to enjoy your vaping to the absolute most. Being easy to operate, this vape mod kit is ready for usage straight out of the box. Simply fill it up with your favorite flavored liquid and you’ll be all set to enjoy hour’s worth of tasty and relaxing vaping. This guitar-shaped E-cigarette is the perfect kit for all beginning vapers out there, allowing them to smoothly enter the world of vaping. Featuring a sufficient temperature control option, this vape mod kit allows you to manually adjust the temperature of your E-cig – letting you adjust your settings according to your own personal liking. With its powerful 1050mAh battery, this fun little vaper ensures that you’ll never run out of juice as it delivers hours worth of usage time on just one full battery. From now on you can be assured that your beloved E-cigarette is always ready for use. Simply fill it up with your favorite liquid and you’ll be all set to enjoy your next vaping sessions in a relaxed and style full manner. This Guitar-Shaped E-Cigarette comes with a 12 months warranty, brought to you by the leader in electronic devices as well as wholesale electronic gadgets..